Early 2019, MikMâäk was resident band at the W:Halll in Woluwe Saint-Pierre (Brussels). Jazz trumpeteer Laurent Blondiau and his fellow musicians have benefited from the occasion to record a new live album and perform on Friday the 1st of February. 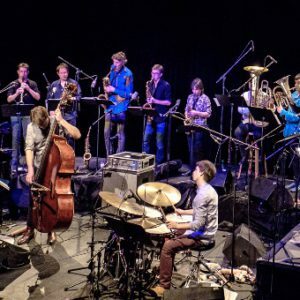 MikMâäk is anything but your average bigband: 16 top musicians with astonishing personalities, a repertoire composed by different band members and a savoury mix of sheet music and improvisations. The artistic coordination lies in the hands of Laurent Blondiau (trumpettist & founder of the jazz collective Mâäk, european revelation of the Académie du Jazz de France 2009 and winner of the Sabam Jazz Award 2015) and Fabian Fiorini (pianist and componser having collaborated with a.o. Ictus Ensemble, Aka Moon, Anna Teresa De Keersmaeker, TG Stan en Kris Defoort). After their debut album “MikMâäk” (2015), the band will release a new live album in October 2019. The album has been recorded during the concert at the W:Halll in Woluwe.